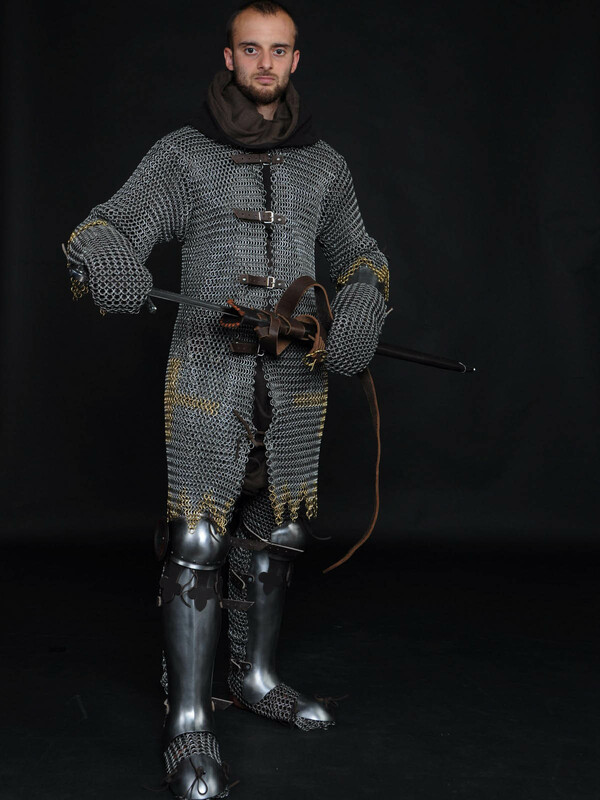 This medieval armor kit combines the most popular parts of body protection of the XIII century. 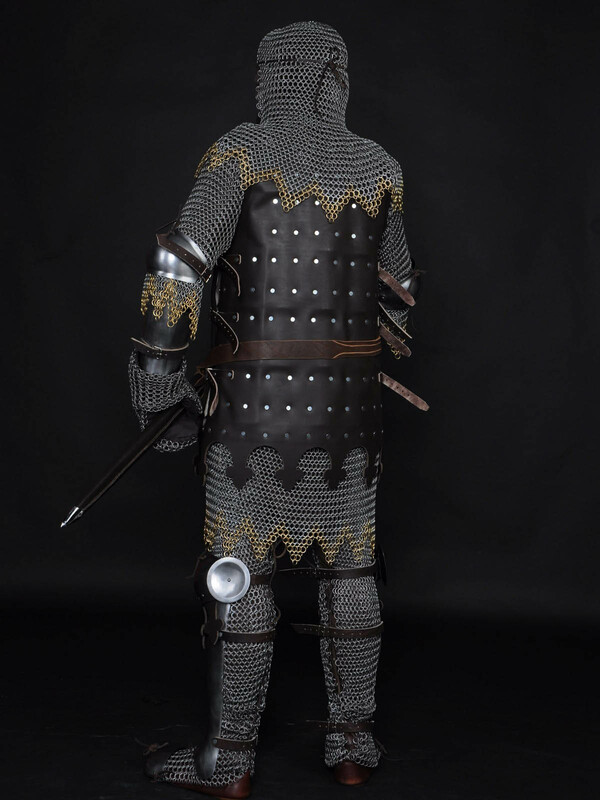 Brigandine was undoubtedly the most popular armour in the XIV century. 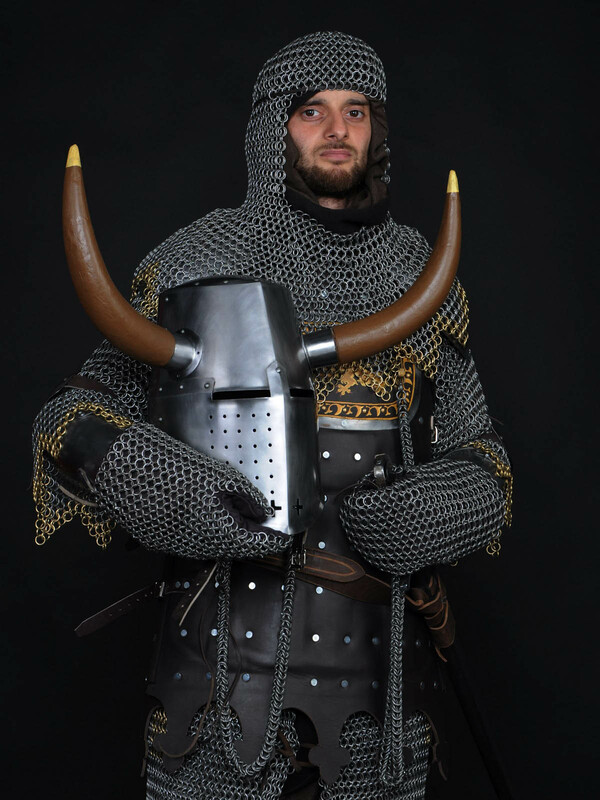 It was a sort of transition stage from chain armour to full-plate armour. 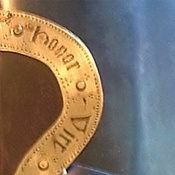 Its special feature was metal plates sewed or clinched to a cloth or leather foundation. The plates were attached on the inside. 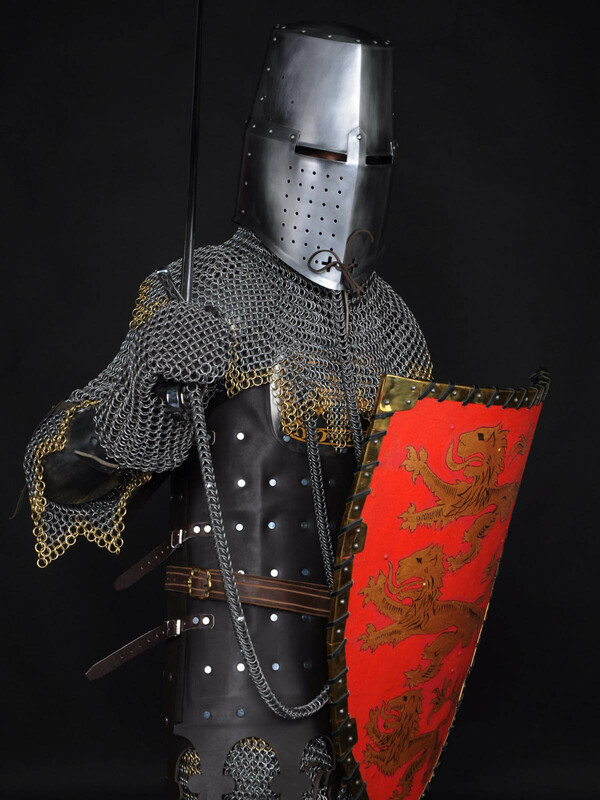 On the presented piece of brigandine there is a metal plate on the outside of the armour which chains going up to the helmet. 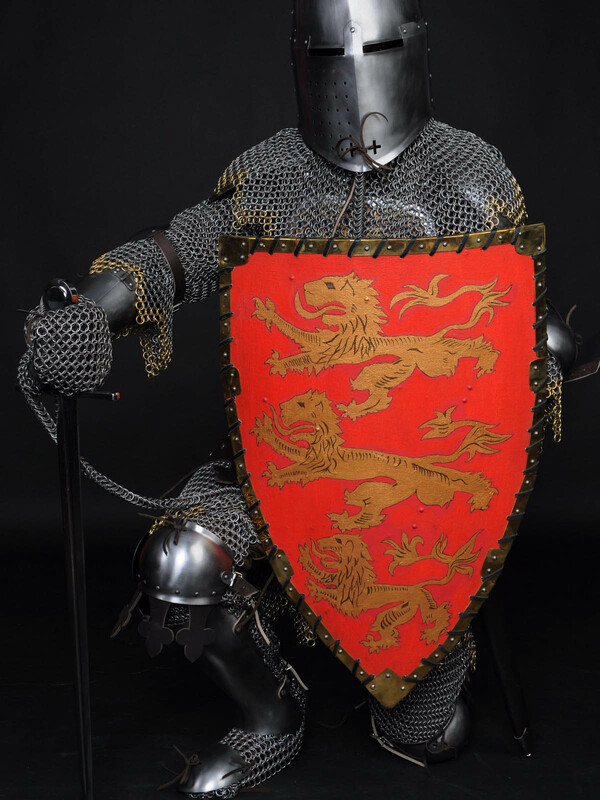 In this way additional protection for the chest was sometimes created in the Middle Ages. 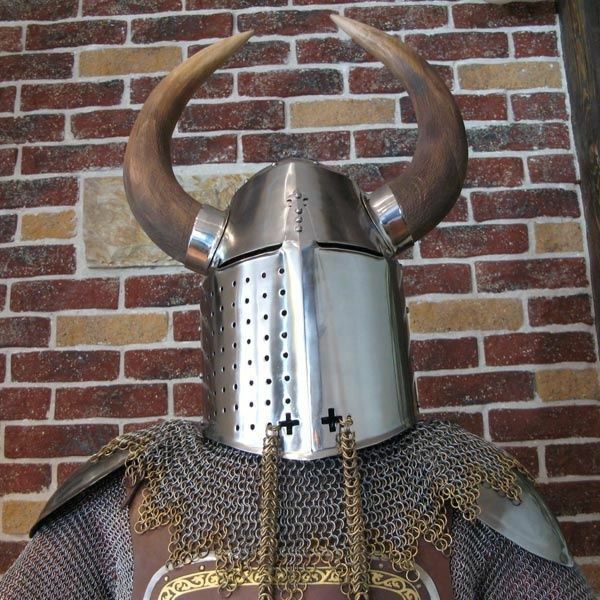 An outside helmet – topfhelm was attached by the chains. such helmet was bulky, limited vision and hardened breathing. 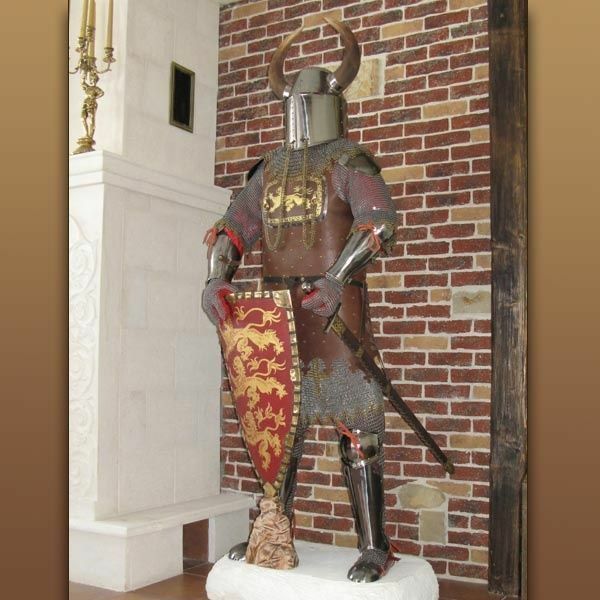 This is why after the spear attack topfhelm was being taken off and the knight stayed in a smaller helmet - bascinet, in which it was easier to fight closely. Sometimes sword was also attached by chains. This model can be corrected according to your wishes. 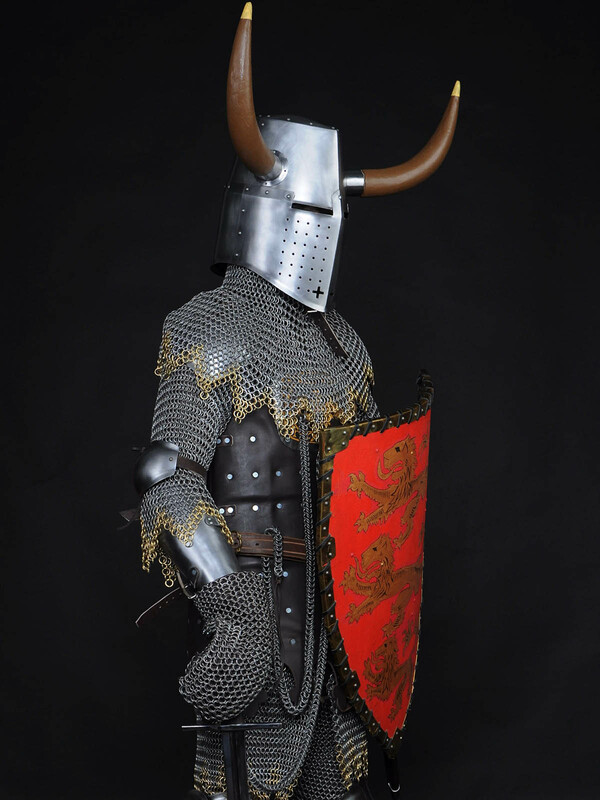 You can choose type and thickness of metal, color of leather straps, decorations for your armour. 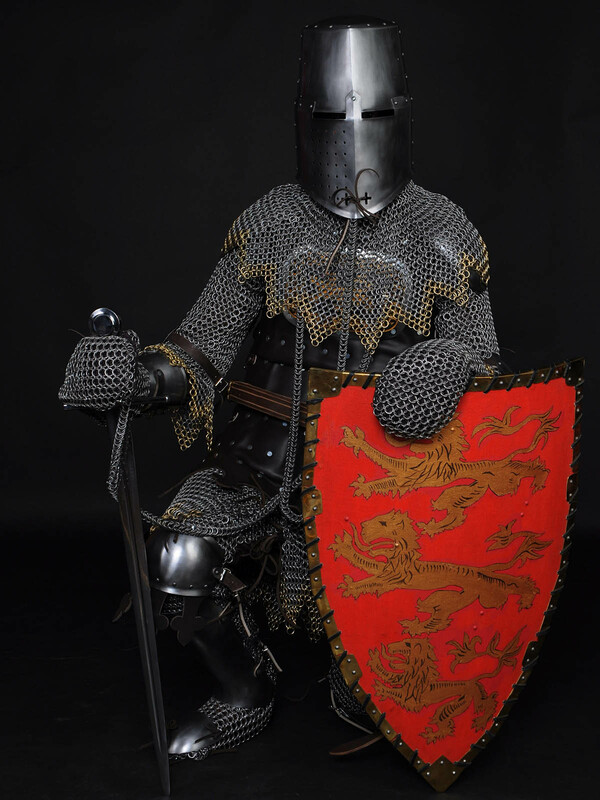 Shield can be ordered separately in our medieval armor shop. 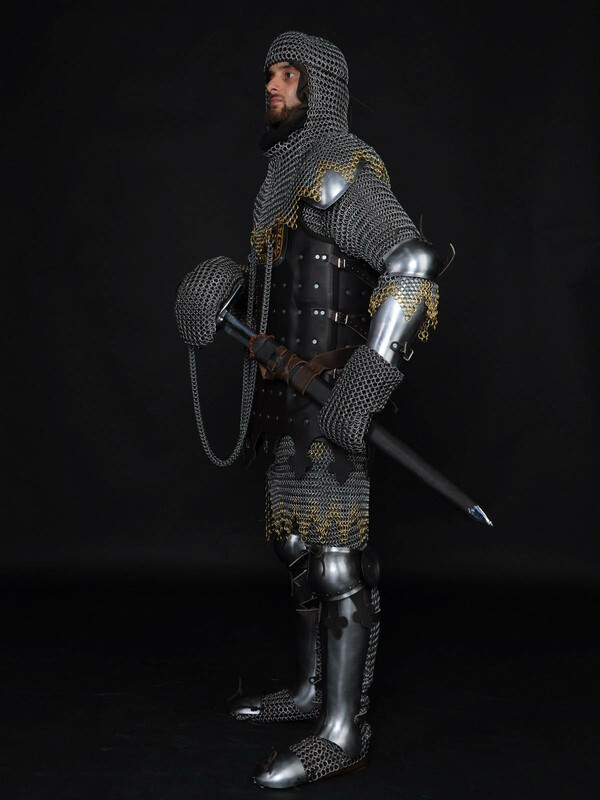 In section “Full armour” you can see all models that we offer for ordering. If you didn’t find any for your taste and wish, please send us photo and description of the required model and we will make it for you. 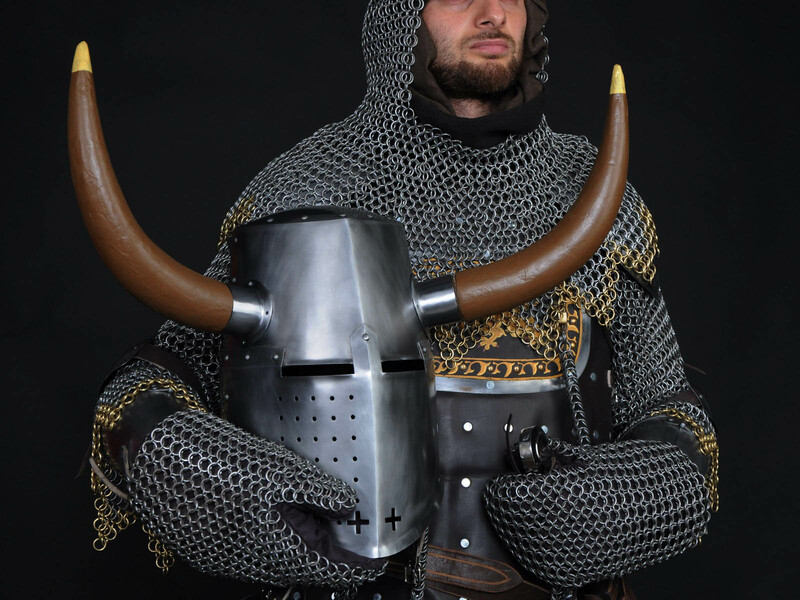 This classic 16th century knights’ armor is a museum replica. All parts are made according to historical analogues. 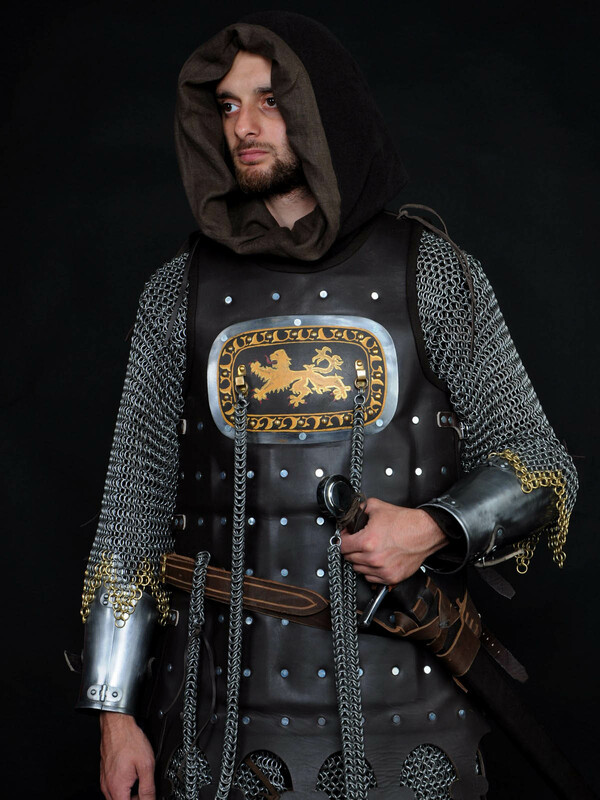 You can use this authentic full medieval armor for: SCA HEMA Larp Stage performances Medieval festivals Reenactment events This custom made-to-measure combat armor is completely handcrafted by our artisans. 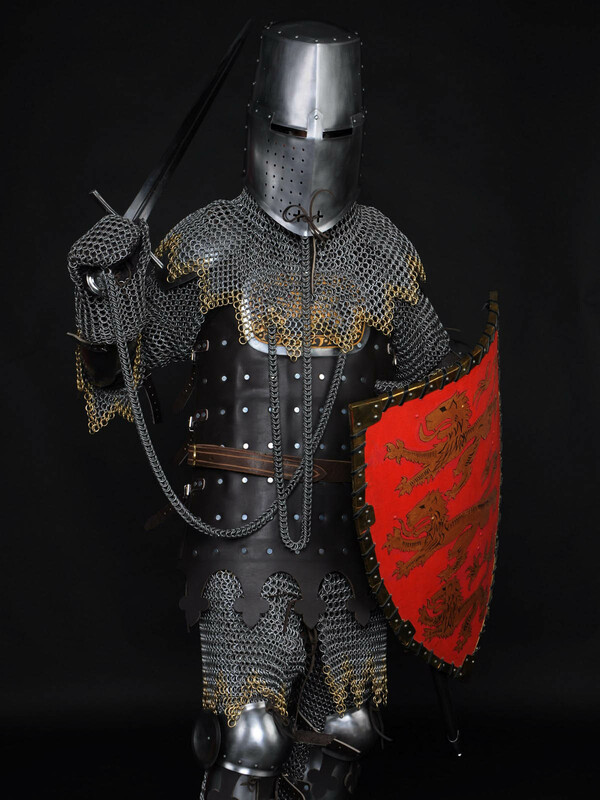 Medieval suit of armor includes the next parts: Closed helmet armet; Plate cuirass with tassets; Pauldrons with rondels; Full arm protection; Gauntlets; Full leg protection; Segmented sabatons Base price includes following options: Cold-rolled steel 1.0 mm for all metal parts; Satin polishing; Black leather belts; Steel nickel-plated buckles; Steel rivets; No decoration; Main photo shows medieval armor with following options: Cold-rolled steel 1.5 mm; Red leather strings; Brown leather belts; Brass buckles; Brass rivets; Decorative brass plates; Blackening as finish treatment; Plume This model can be corrected according to ..
Armour in Churburg style was named by an authentic medieval armor that is kept in the castle of Churburg (South Tyrol in the North of Italy) and it belongs to the end of XIV century. 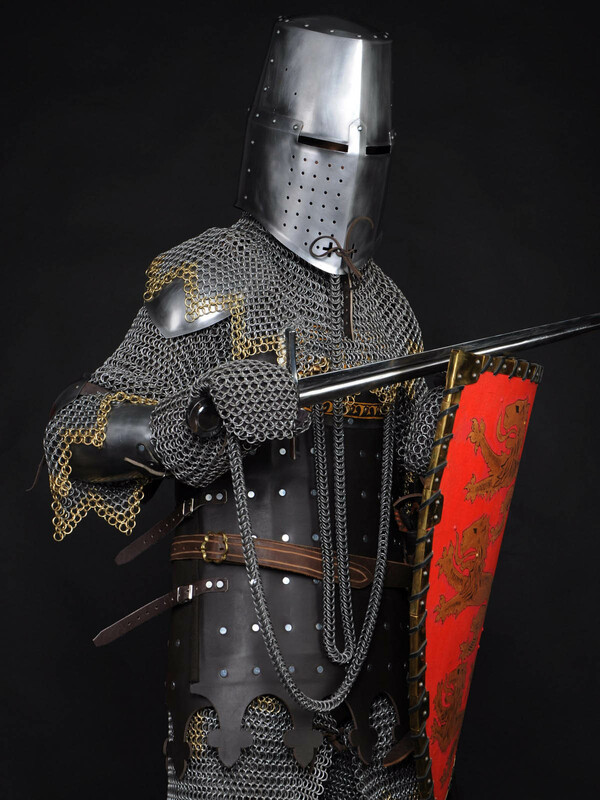 During this time on the territory of modern Italy the armour makers start to produce armour of full-plate shells (they would be given the name of Milanese type). 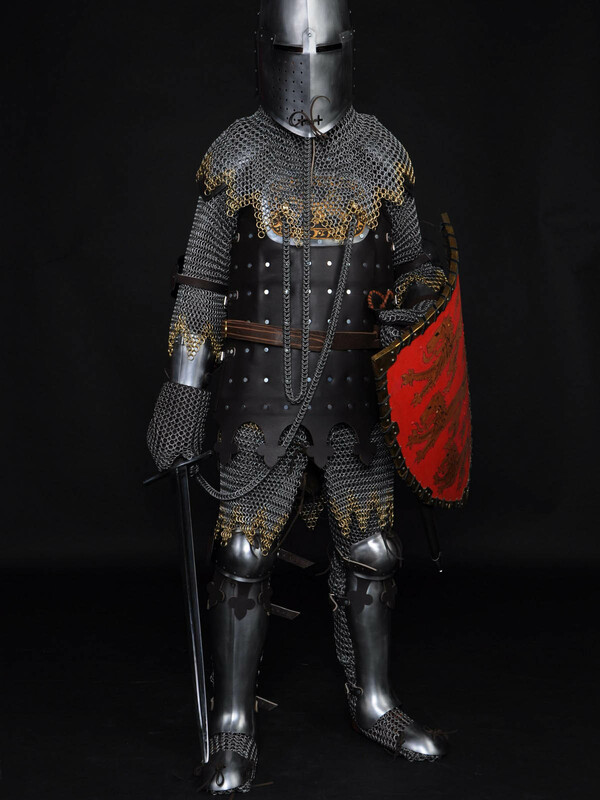 Later on bascinet would be out of use giving way to armet and barbute in Milanese armour. 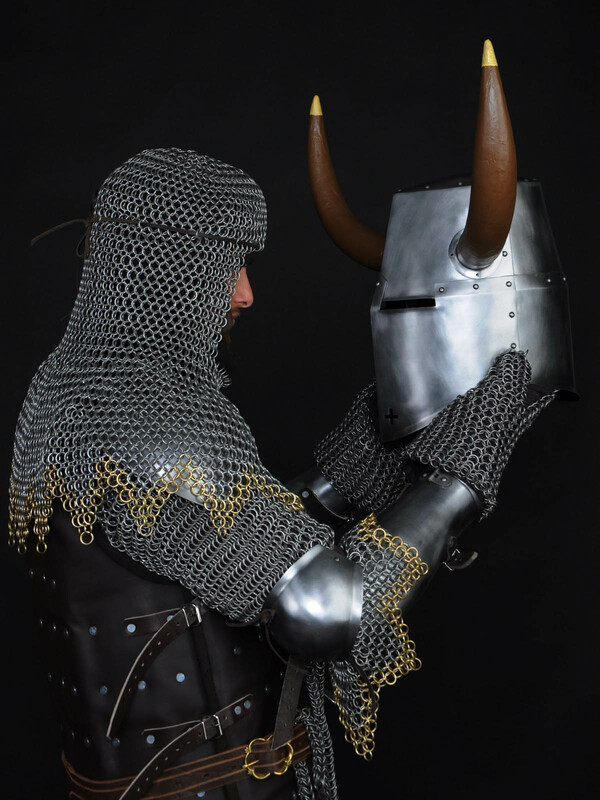 Protection of neck and collarbone was enabled by chainmail aventail, which was attached to the helmet. Chest is covered with a series of plates. 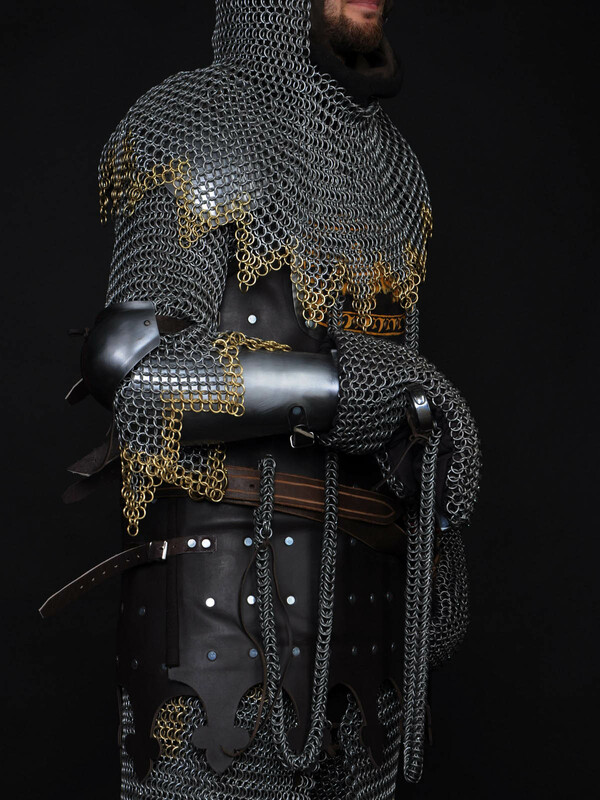 The lower part of the stomach and the groin are protected by chained armour. Back is not protected by this piece. 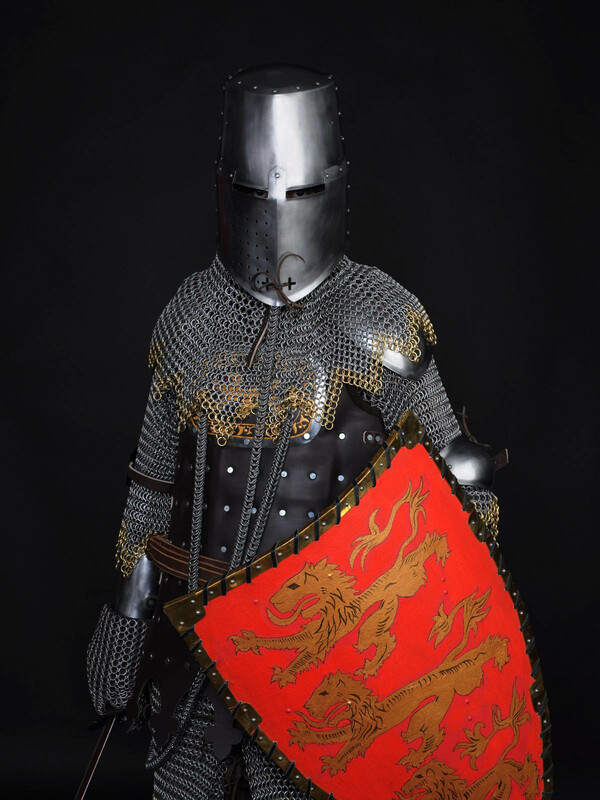 It was supposed to be matched with chained armour. Shoulder straps consist of several segments which are put one on top of the other to enable better movement. 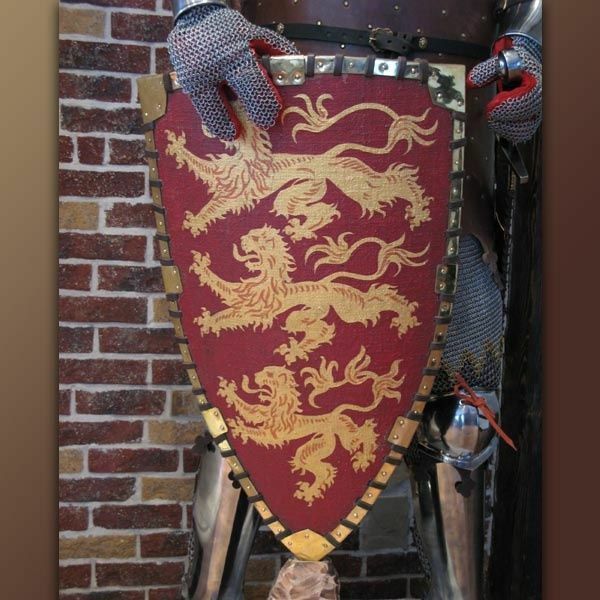 Elbow pads were enlarged so that there was no need for a shield in the battle. 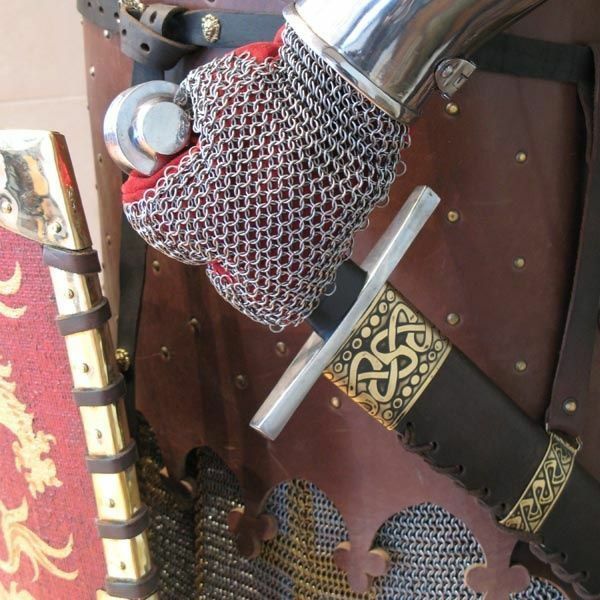 Bracers represent segmented flexible gloves, the metal segments of which covered fingers on the outside. Greaves c.. 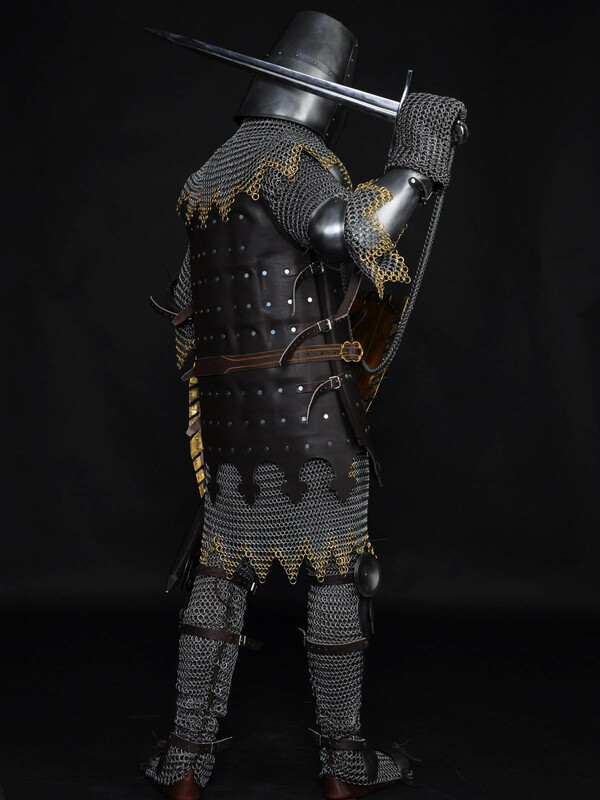 This model of armor is the authentic copy of a piece dated back to 1380 year which belong to Churburg castle, South Tyrol. 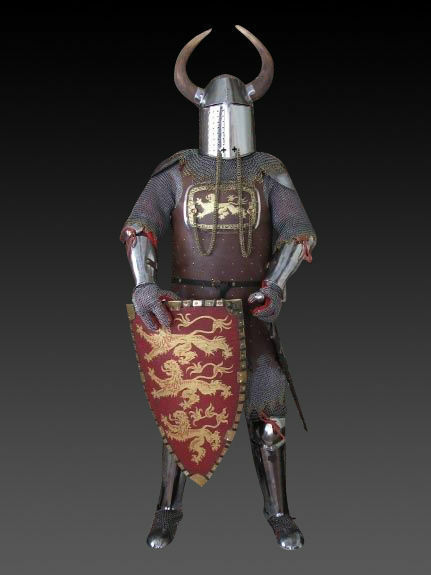 The whole piece of the armour was not preserved and thus was completed by the details characteristic for those times. 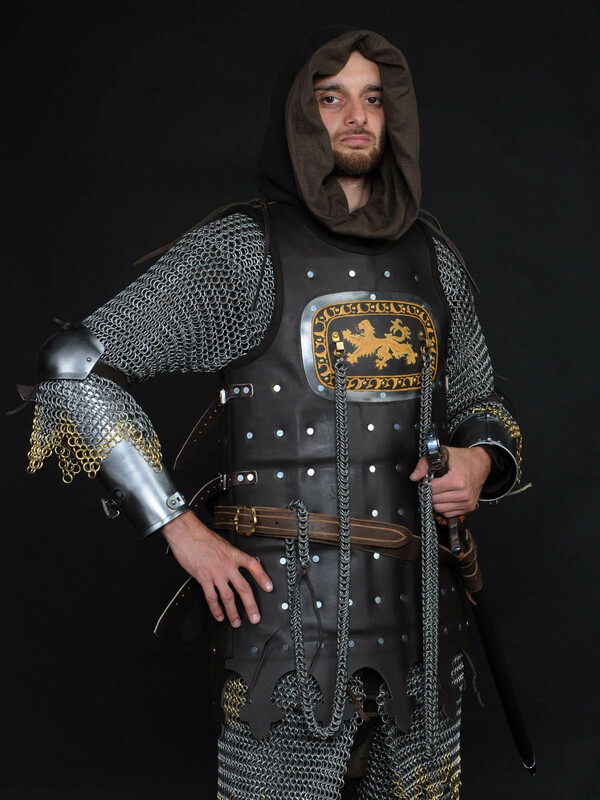 You can use this full medieval armor for: SCA HEMA Larp Stage performances Medieval festivals Reenactment events This made-to-measure battle armor is completely handcrafted by our artisans. 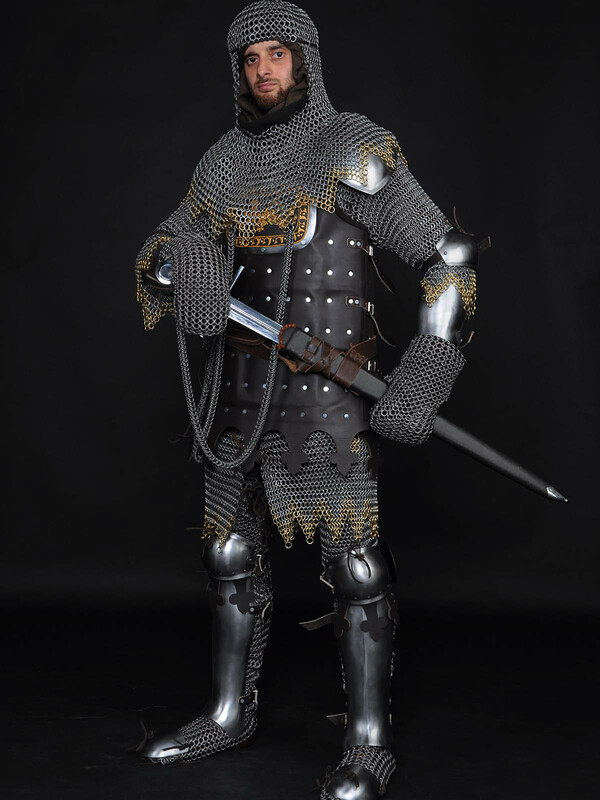 Medieval suit of armor includes the next parts: Helmet bascinet “Hounskull”; Plate spaulders; Breastplate; Full plate arms; Gloves; Full plate legs; Closed greaves; Sabatons Base price includes following options: Cold-rolled steel 1.0 mm for all metal parts; Satin polishing; Black leather belts; Steel nickel-plated buckles; Steel rivets; No decoration Main photo shows medieval armor with following options: Cold-rolled steel 1.5 mm; Brown leather belts; Brass buckles; Brass rivets; Mirror polishing as finish treatment; Dec.. 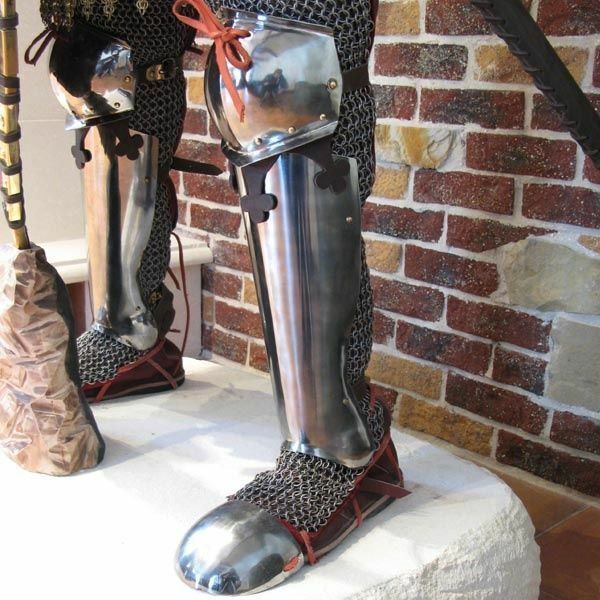 Coat of plates’ armor in LARP and fantasy style (3x3 plates) or Bree elder’s brigandine Where the Great West Road meets the Greenway, to the northeast from the Shire and to the south from Fornost ruins, which was a capital of Arnor, in the middle of the deserted wastelands, Bree lays around the big hill – the largest human settlement to the west from the Misty Mountains. The Men of Bree were brown-haired, broad, and rather short, cheerful and independent: they belonged to nobody but themselves; but they were more friendly and familiar with Hobbits, Dwarves, Elves, and other inhabitants of the world about them than was (or is) usual with Big People. 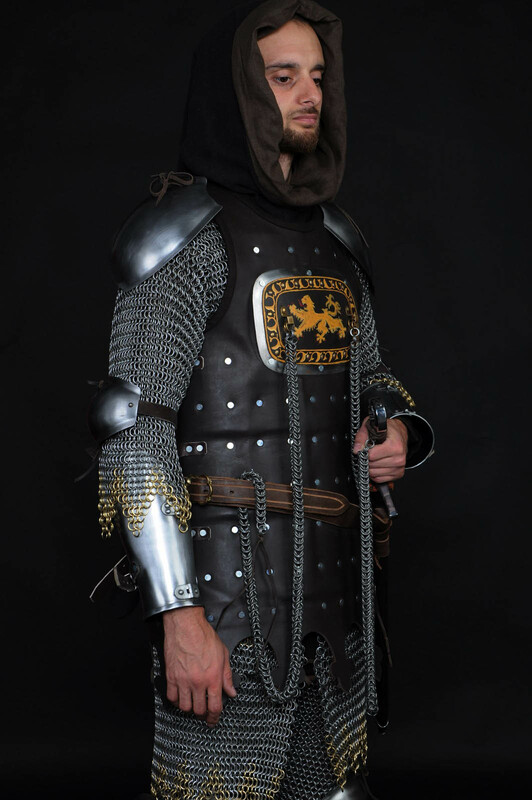 According to their own tales, they were the original inhabitants and were the descendants of the first Men that ever wandered into the West of the middle-world… (с) Well, today we would like to get you acquainted with elder of these wonderful people, or, more precisely, with his brigandine armor. Base layer is made of soft, but firm wool (or it may be made of.. 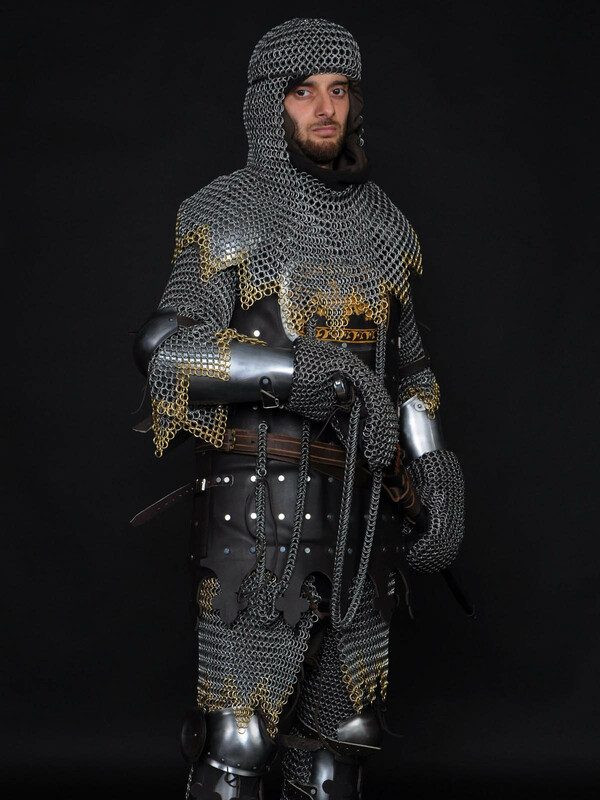 Coat of plates armor in LARP and fantasy style (2x4 plates) If times of the Crusades call for you, romance of free-and-easy forest life tempts you and rough Middle Ages don’t frighten you… If stylish Tyrolean hat and woolen doublet with chausses fit you well, but you have no wish to wear heavy chain mail… If your arms are strong and steady and bow seems too delicate weapon for you, though heavy sword – or even log – fits you much better…Well, if you would like to assume the role of the Little John – close comrade of Robin Hood, big, cheerful and strong man, so we have good news for you. 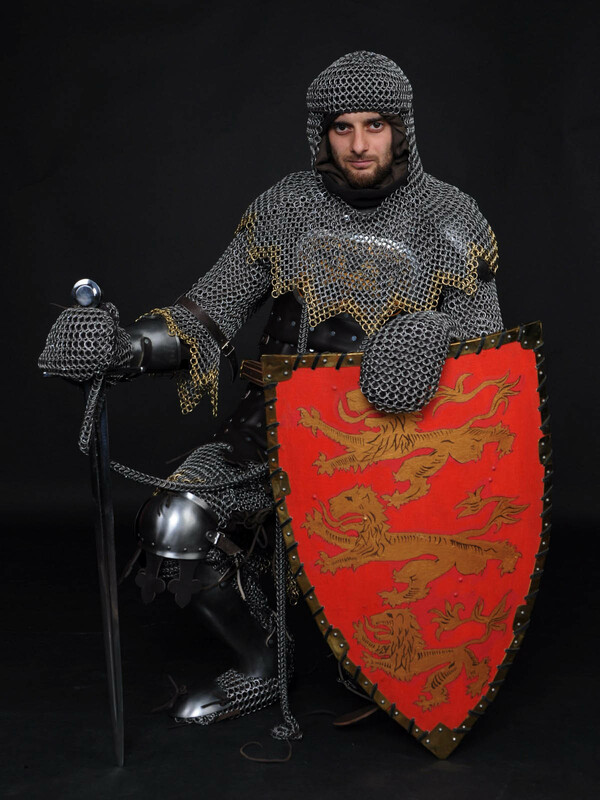 We cannot provide you with Sherwood Forest, but proper coat of plates armor – easy enough. 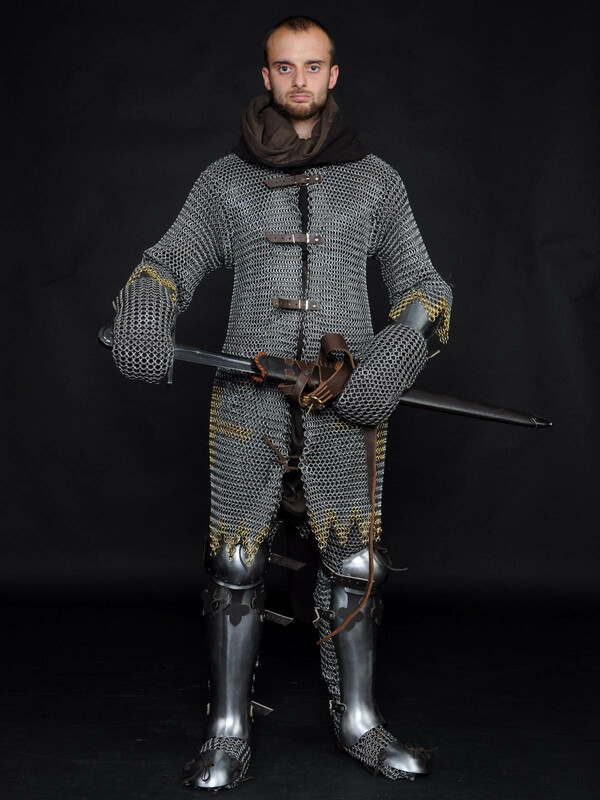 We created this medieval fantasy armor especially for those who loved to read ballads since childhood and was always dreaming to become a main character there. 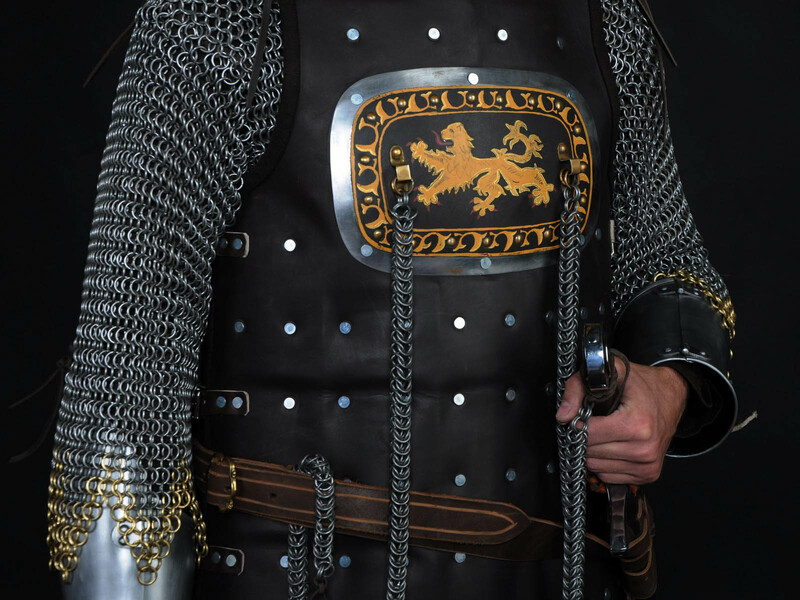 Thin light but firm steel plates are riveted on the vest of thick and soft leather of wine-red color – 8 plates from the front and 10 on the back part. 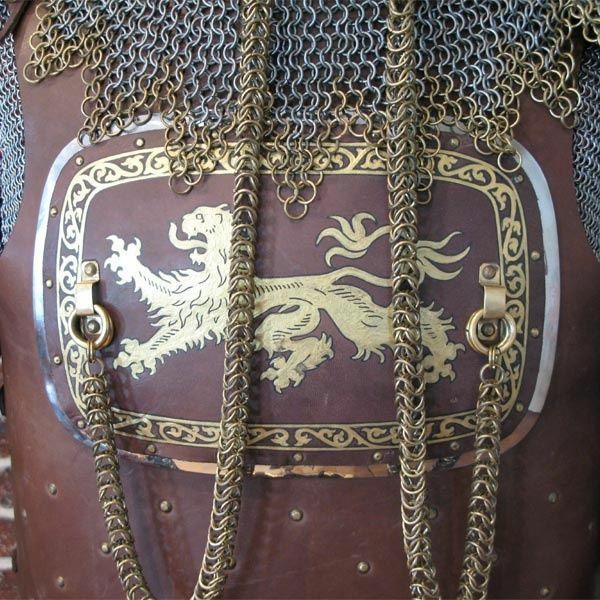 Brigantine is fastened on the sides with ad..
Leather brigandine in style of 14th century So, here is a brigandine of the rare beauty and utility, made in style of the XIV. — In what style? — Style of the XIV century. 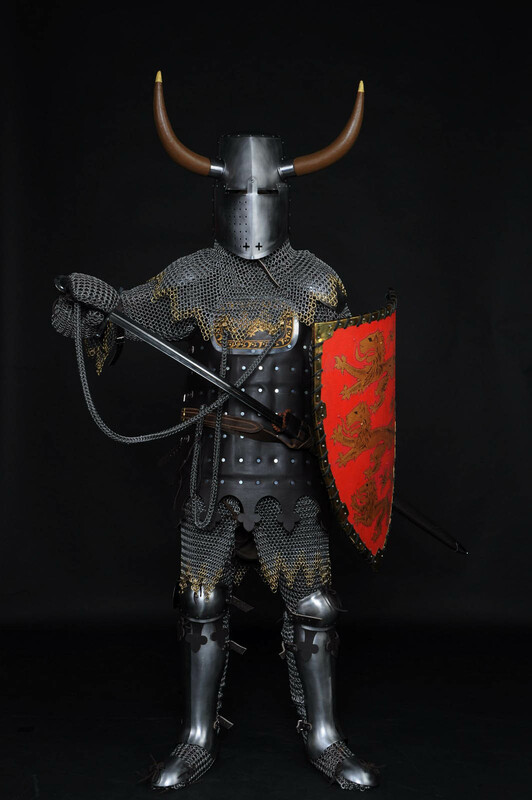 — In style of the XIV century?! — YES!!! 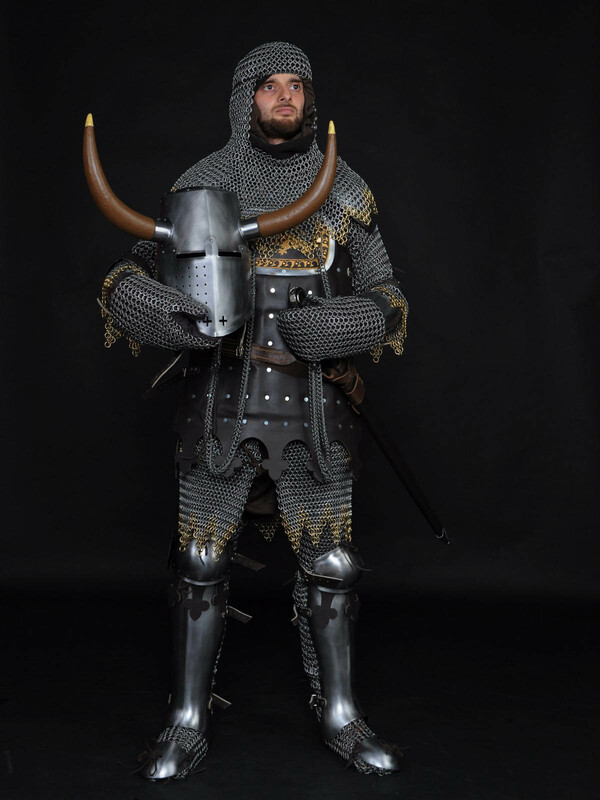 In style of the XIV century! 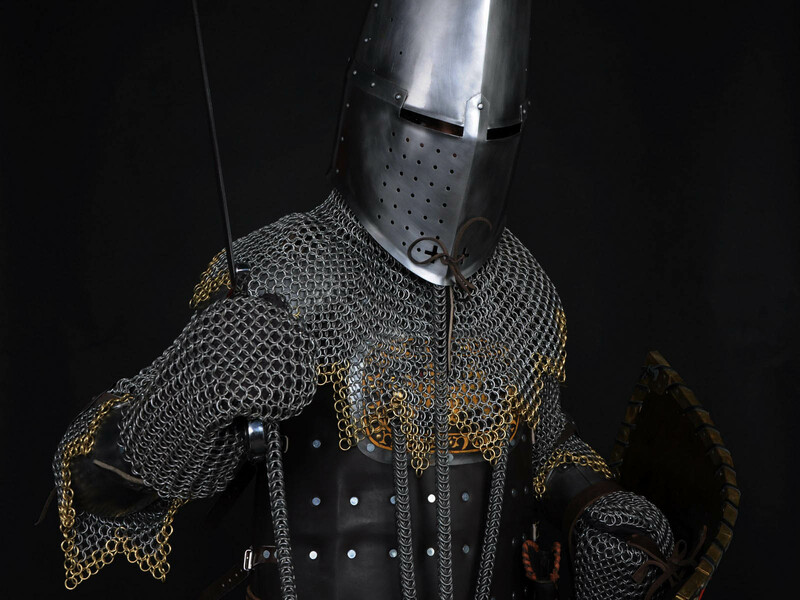 Well, that’s all about knights, halberds, chapels, doublets, uncomfortable chausses and more uncomfortable Poulaines, plague and brigandines, tons of bloody brigandines! 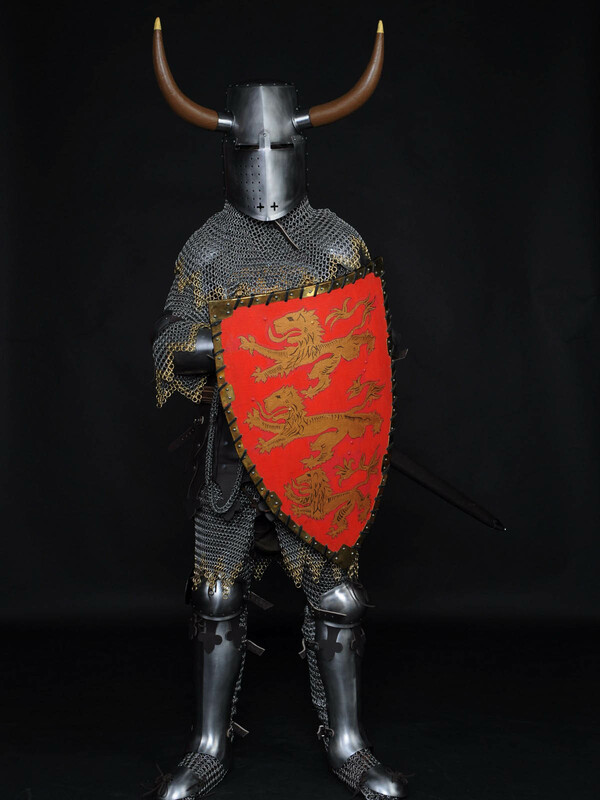 In style of the XIV century! 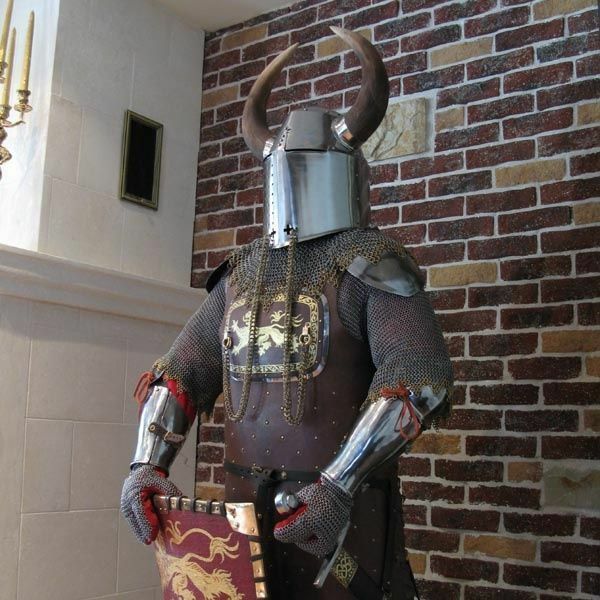 Once we looked at all the chthonian horror, what did have place those times, so we decided to make comfortable brigandine for all connoisseurs, in other case it would be a bit stiff. What does it mean – not a precise reconstruction?! Oh, you are so touchy! Probably, it is not a reconstruction, but it will protect of blows much better than these, which are. 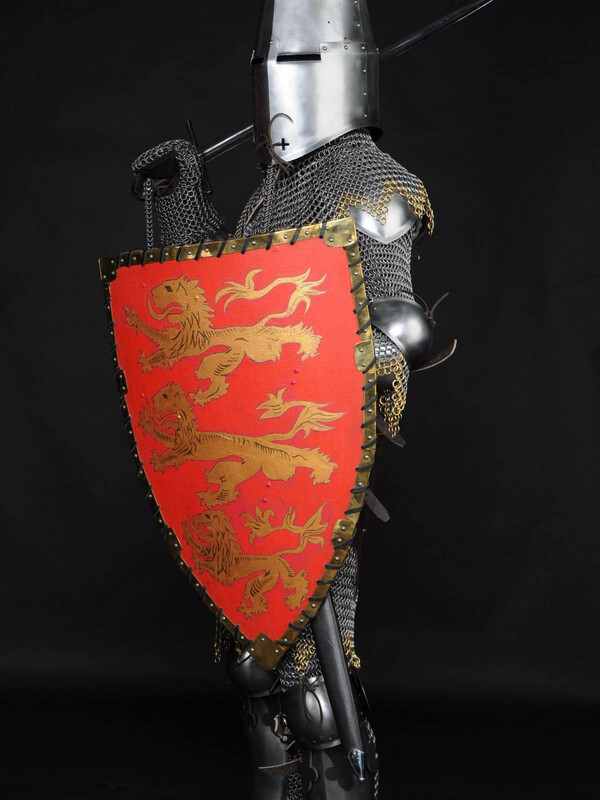 Do you need a protection or reconstruction? If the second one, so we may add plague to your kit. Don’t want that? Well, up to you. 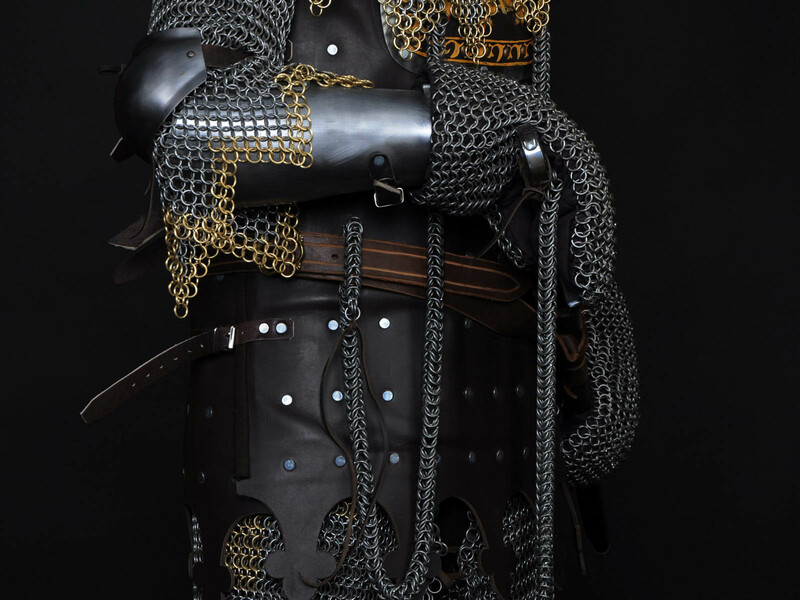 So, we created this leather lamellar armour for everyone who values XIV century, but his ow..